Many of us have had a laugh at Velominati’s The Rules. The Rules of Cycling, are apparently for ‘real cyclists’. 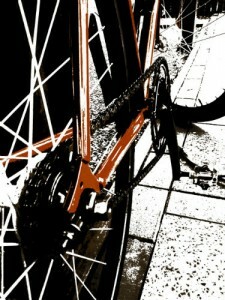 Fortunately, we are not all posers on carbon fibre road bikes that are well beyond our own athleticism. We are not the keepers of the cog. We are real riders who just get on with the job, embarrassing riders who are just in it for the tech gear and fashion. Said posers are often corporate executives who have squeezed their fat arses into tiny spandex and bought a bike they are far too heavy for — often a Colnago or Pinarello. These riders aspire to conform to Velominati’s The Rules. We do not. Following are my alternative rules of cycling, for real riders. Rule #3. It is not all about the bike; it is all about the motor (your legs). If someone is riding a 20-speed, carbon fibre, drop bar road bike and you overtake and stay in front of them on your old steel-frame fixie, then kudos to you! They are posers not worthy of their bike. Rule #4. Don’t overcapitalise your motor. If you have the legs to ride an expensive carbon fibre race bike like it was designed to be riden, I doff my helmet to you. If you ride your Tour de France replica race bike at 22 km/h on flat roads, even on your slow day, you are a poser. Of course, Rule #A-7 also applies. Rule #5. There is no shame in being overtaken by someone on a better bike. If you are on your old steel-frame fixie and get overtaken by someone riding a 20-speed, carbon fibre, drop bar road bike then, hey, at least you are out riding! When overtaking, steel frame trumps alloy frame; alloy frame trumps carbon frame. Riser bars trump flat bars; flat bars trump bullhorns; bullhorns trump drop bars; drop bars trump aero bars. If you are riding a carbon fibre bike with aero bars, you had better be fast, even on your slow day. Once again, Rule #A-7 also applies. Rule #6. You do not need to buy the most expensive bike in the store. You do need to buy a bike with the right frame size for you and get your bike set up to fit you properly for your intended style of riding. Rule #7. Beauty is in the eye of the beholder. If you love it; ride it. Often. Rule #8. The correct number of bikes is simply n, where n is the number of bikes you can regularly ride. Bikes are meant to be ridden. Often. If you don’t ride one of your bikes, give it to someone who will, because you are not worthy of owning it. Rule #9. Forget the fashion police; ride in clothes you are comfortable in. Don’t wear cycling team kit, unless you are actually part of the team! And make sure your crotch, bum crack and, if you are female, breasts, are appropriately covered. There is nothing worse than threadbare spandex showing your fat arse to the world! If overtaking another rider, regular clothes trumps baggy bike shorts; baggy bike shorts trumps spandex; everything trumps championship or race leader jerseys. Rule #10. Hairy legs are fine. There is no reason to shave your legs. Some people think you have only joined the exclusive club of real cyclists when you have shaved your legs. They are posers. Hairy legs trump shaved legs, everytime. Rule #11. Take as much water as you need so as to not stop on your ride. In hot weather, take more; in cool weather, take less. Don’t take more than you will need. Rule #12. You do not need gels, energy bars and sports drinks unless you are planning to spend more than two hours in the saddle. Even then, take with moderation. Rule #13. Make sure you can perform basic maintenance to your bike on the road – changing a tube, tightening an allen key. When the poser on the drop bar road bike gets a flat, you can help them get going again. Don’t be the clueless poser though. Rule #14. Saddle bags are good. Carry your spares under the saddle; carrying them in your jersey pockets will just make you uncomfortable and make you look like a hunchback. Carry only what you need – a spare tube, tyre levers, CO2 and a couple of allen keys should solve most onroad mechanicals. You may also carry a small pump on the frame next to your water bottle and glueless tyre patches for longer rides when you may be unlucky enough to get more than one puncture. Rule #15. If you see another rider on the side of the road, check that they are okay and stop if they need assistance. Be aware that aforementioned poser may not accept assistance from someone on a lesser bike. Rule #16. Obey the road rules. Give drivers a friendly thank you wave if they give you room and apply the road rules to you. The Final Rule. Don’t take it all so seriously. Some cyclists ride around as if they have removed their saddles and have their seat posts wedged up their butts. Chill out! Laugh. Love. Ride. The world will be a better place.